Push the safety catch (1) on the mixing gun upwards and slide the toothed dual piston rod (2), toothed side down, into the H-shaped slot at the front of the gun. 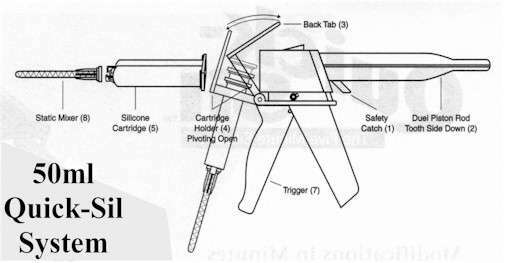 While holding the safety catch up, slide the dual piston rod through the gun handle until the piston ends are flush against the front of the handle, then release the safety catch. Lift up the back tab (3) of the hinged cartridge holder (4), until the holder is folded open. Push the cartridge (5) through the opening in the hinged cartridge holder until it is fully inserted, fold the cartridge holder back to its original position (do not force! ), and press down on the back tab (3) until it snaps shut. Remove the cartridge cap (6) by turning it counter-clockwise, holding the cartridge vertical with cap at the top. Using slight pressure on the trigger (7) of the mixing gun, check to ensure that both components are being ejected evenly.Then wipe the ejection aperture off, and screw the static mixer (8)into position. The Quick-Sil silicone system is ready to use. For orthotic modifications, sand or cut depression in surface where pressure relief is desired. Ensure that surface is dry and free of grease and dust. Place device to be relieved in a position where depression will be level. Pull trigger and pump Quick-Sil into the depression until the depression is nearly full. To avoid overflow, wait until silicone has 'self-leveled before adding any additional silicone. Quick-Sil is a real time saver for shoe excavations. To relieve severe plantar pressure, simply excavate the insole with a knife or portable grinder, prime with QuickPrime, and fill with Quick-Sil. While Quick-Sil is ideal for prosthetic distal end pads, we recommend using our 330ml. gun and cartridge for this purpose. UCO's new QuickPrime adhesive primer allows the practitioner to adhere Quick-Sil to many other materials. Surface preparation is a critical component of this procedure. First, the contact surface must be roughened. Next, make sure that the surface is dry and free of dust or grease.Squeeze a few drops of Part A onto a mixing plate,squeeze an equal amount of Part B on the mixing plate near the drops of Part A. Mix the two parts together thoroughly for approximately 10-15 seconds, using a small spatula or palette knife. DO NOT MIX TOGETHER until you are ready to apply QuickPrime. After mixing, IMMEDIATELY paint onto surface that you wish to adhere Quick-Sil. Use a stiff brush to apply a thin even coat. Complete spreading of QuickPrime within 25 seconds. Allow QuickPrime to cure for approximately 5 minutes, or until completely dry.Then inject Quick-Sil, which will bond firmly to the primed surface. Unopened Quick-Sil may be stored in a cool, dry place for approximately one to three years.Once opened, cap tightly and store for up to six months. UCO recommends storing in refrigerator. Bring to room temperature before use.